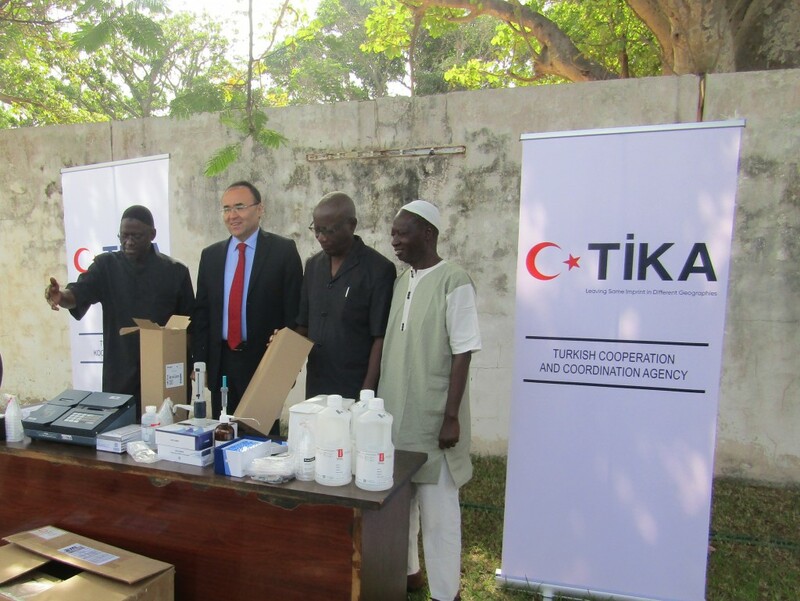 Turkish Cooperation and Coordination Agency (TİKA) granted laboratory equipment and supplies to Gambia National Food Safety, Processing and Marketing Institution. TİKA has continued its support to Gambia, a close friend and ally to Turkey, over the years. Recently, TİKA granted laboratory equipment and supplies to Gambia to help combat “aflatoxin”, a type of toxin found on peanuts, which is the most important export product of the country. The handover ceremony was attended by Turkish Ambassador to Banjul İsmail Sefa Yüceer, TİKA Banjul Deputy Program Coordinator Mehmet Akif Eyigün, and National Food Safety, Processing and Marketing Institution’s Director Anthony G. Carvalho. Speaking during the ceremony, Ambassador Yüceer said that these devices and supplies were granted by the Republic of Turkey via TİKA and thanks to tests that will be performed using these devices, the safety of Gambia’s most important sources of revenue, peanuts and other agricultural products, will be ensured and added value will be created. Anthony G. Carvalho, the Director of National Food Safety, Processing and Marketing Institution, thanked TİKA and Turkey for this beneficial and timely contribution. He stated that they are working towards alleviating the effects of aflatoxins and these devices will greatly help with their progress. TİKA Banjul Deputy Program Coordinator Mehmet Akif Eyigün expressed that TİKA is proud to be a part of this project, which will boost rural development. He also noted that with the opening of TİKA Banjul Office in October, TİKA’s collaborations with the National Food Safety, Processing and Marketing Institution as well as with other institutions in Gambia has increased and will continue to do so.